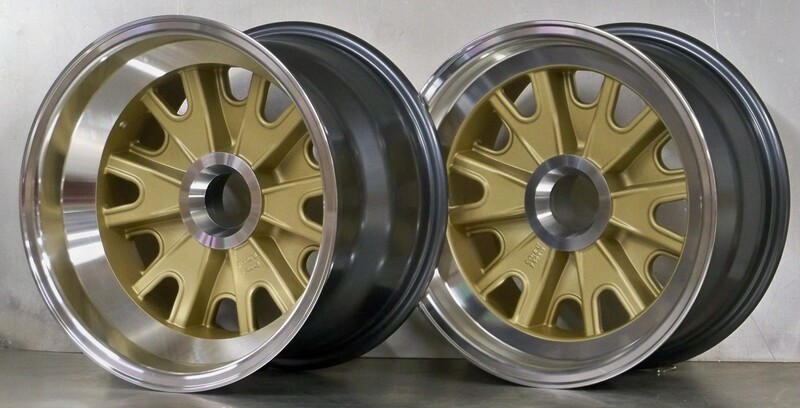 Details: HA15 magnesium gold centers machine polished rims - we have the following. (Also available in 5 pin)Set of 4. 2 x 15 x 7.5. 2 x 15 x 9.5 pin circle 6 on 4.25 to suit 1/2 inch pins. Front wheel backspace 2.75. Rear wheel backspace 3.5. The above is a direct fit on CSX series ,Kirkham and some others ,we can offer other backspace options to suit ERA ,CCX ,please call 619 952 4717 for details. These wheels look like new magnesium rims before the elements have gotten to work! The centers have a slight metallic glint in the sunlight that does not show up in the photos.